Disclosure: I am participating in an Ambassador campaign on behalf of Mom Central Consulting for Kohl’s. I received promotional items and product samples as a thank you for participating. If your kids are high-flying action fans, you'll be delighted to hear that Kohl's has released its new Jumping Beans Magic At Play collection, featuring the Planes: Fire & Rescue characters! 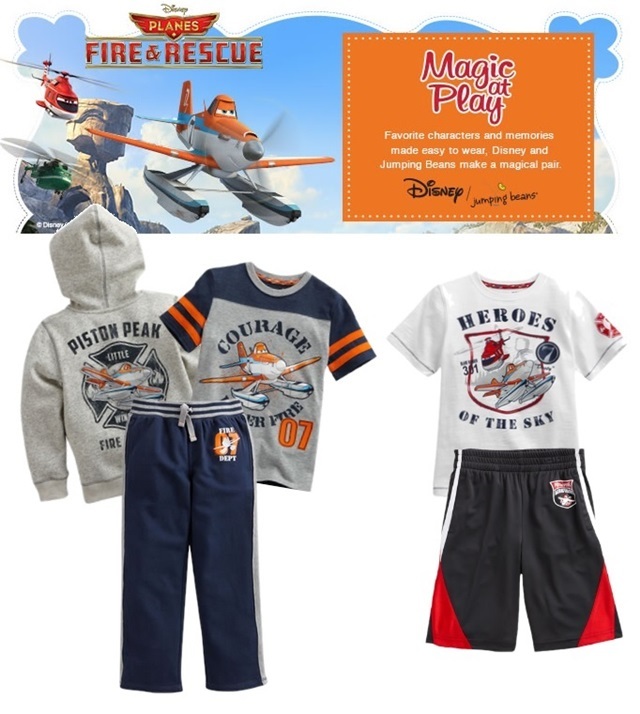 This all-boys collection includes sweats, shorts, tees, long sleeves, & hoodies, and is available just in time for the Planes: Fire and Rescue movie theatrical release on July 18th. This marks the second capsule collection from the one-of-a-kind collaboration between Kohl’s and Disney, named Magic At Play. Where the spirit of Disney and their beloved characters are paired with fun, unique, comfortable, and stylish apparel pieces for children ages infant through kids. You may remember last time, my daughter, Arianna, had fun playing dress-up in a Minnie ensemble from the first collection, Americana. 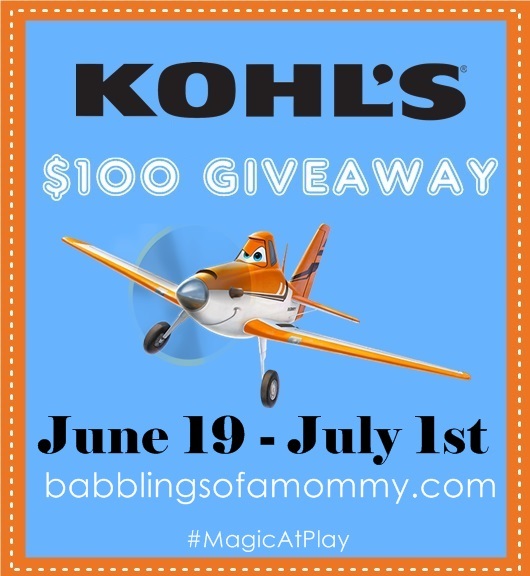 Now for the fun part - Mom Central is graciously giving one of my readers a $100 Kohl’s gift card so you can shop the collection yourself! To enter to win just follow the instructions below. I would get Disney Planes Dusty "Daddy's Little Hero" Tee by Jumping Beans® - Baby. I like the Disney Planes "Fire & Rescue" Fleece Hoodie by Jumping Beans® - Toddler! I love the Courage Under Fire shirt. Disney Planes "Hero in Training" Tee by Jumping Beans® - Toddler would be cute on my son. I would like to get the Disney Planes Dusty "Rescue!" Tee . I would get the Disney Planes Dusty "Rescue!" Tee by Jumping Beans for my son. I like the Disney Planes "Fire Rescue" Fleece Hoodie by Jumping Beans. I would love to get the Disney Planes "Fire & Rescue" Hooded Tee by Jumping Beans® - Toddler. I would get the Minnie Mouse polka dot dress tutu dress. I would love to get the Disney Planes Dusty "Rescue!" Tee by Jumping Beans® - Toddler for my grandson! I like the Jumping Beans® Ruffle Dress – Girls 4-7, and the Jumping Beans® Ruffled Babydoll Tank – Girls 4-7. Also the Jumping Beans® Athletic Shoes – Girls. My niece would look so cute in these items. I'd like to get the Disney Planes Cabbie Tee by Jumping Beans®. Visited the site and I think I would purchase Disney Planes Dusty "Daddy's Little Hero" Tee by Jumping Beans® - Toddler and Disney Planes Blade Ranger "Copter In Charge" Tee by Jumping Beans® - Toddler. I really like the Disney Planes Dusty Tee by Jumping Beans® - Boys 4-7. I would love the Disney Minnie Mouse Striped Tutu Dress by Jumping Beans® - Toddler for my daughter. Oh I would love to get the Disney Planes Blade Ranger "Copter In Charge" Tee! So cute! 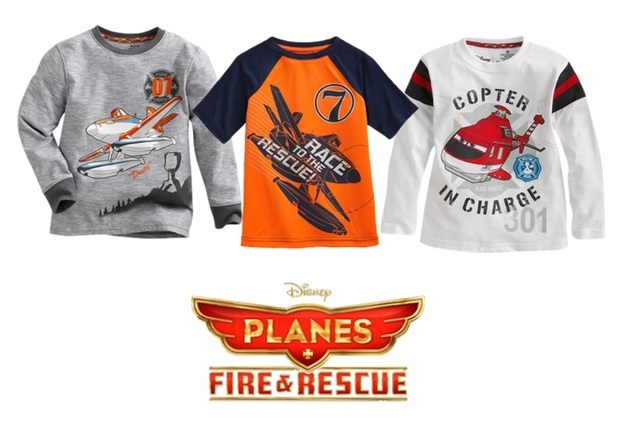 My favorite is the Disney Planes Dusty Mock-Layer Tee. I'd like to get the Disney Minnie Mouse Star Scooter by Jumping Beans. They have so many cute things. I esp love the Disney Minnie Mouse tutu dress. I like the Hero In Training shirt. I like the Minnie pink and grey razor back tee and the Minnie pink stripped tutu dress. I like the Disney Minnie Mouse Polka-Dot Tutu Dress. The "Hero in Training" shirt stole my heart. I would like to get the Disney Planes Blade Ranger French Terry Pants. I'd love to get the Daddy's Little Hero t-shirt. My son would love to have this, He and his daddy (Hubby) are best friends.